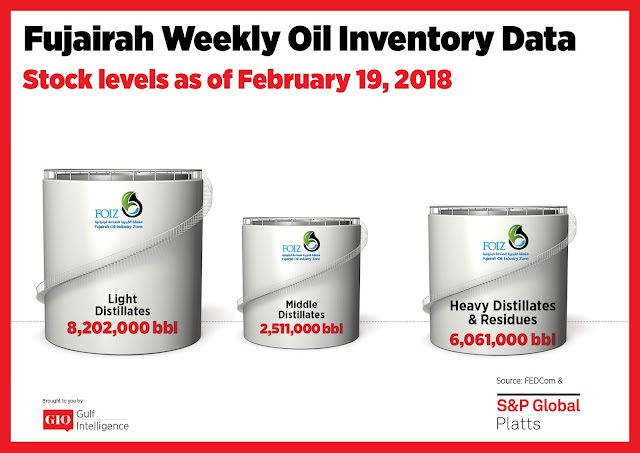 Total oil product stocks in the UAE port of Fujairah rose by 2.8% on the week, reaching 16.774 million b/d as of Monday, as light distillates fell from last week's record high, and heavy distillates rebounded from a record low, according to latest data from the Fujairah Energy Data Committee, or FEDCom. Stocks of light distillates fell 5.2% on the week to 8.202 million barrels. This is after stocks rose to a record high of 8.655 million barrels a week earlier. Gasoline markets in the US, Europe, and Asia are all currently weak, weighed down by heavy supply from refiners looking to meet gasoil and jet-kerosene demand, S&P Global Platts Analytics said in a report. 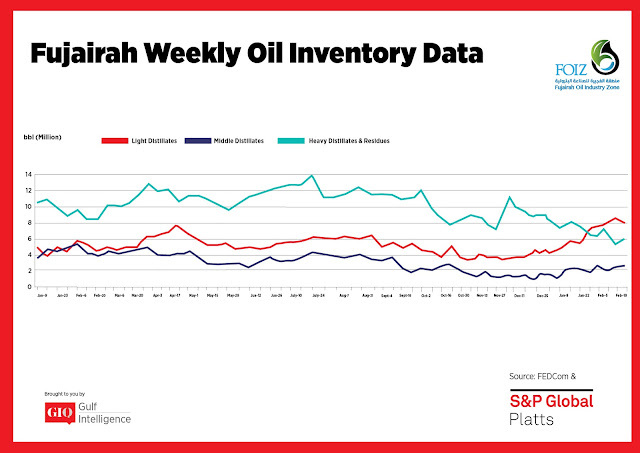 Meanwhile, spot gasoline demand in the Middle East has been quiet, with no new tenders from usual buyers such as Kuwait Petroleum Corp and Dubai's Emarat reported since the beginning of February, the report said. Stocks of middle distillates rose by 6.2%, or 146,000 barrels, on the week to 2.511 million barrels. 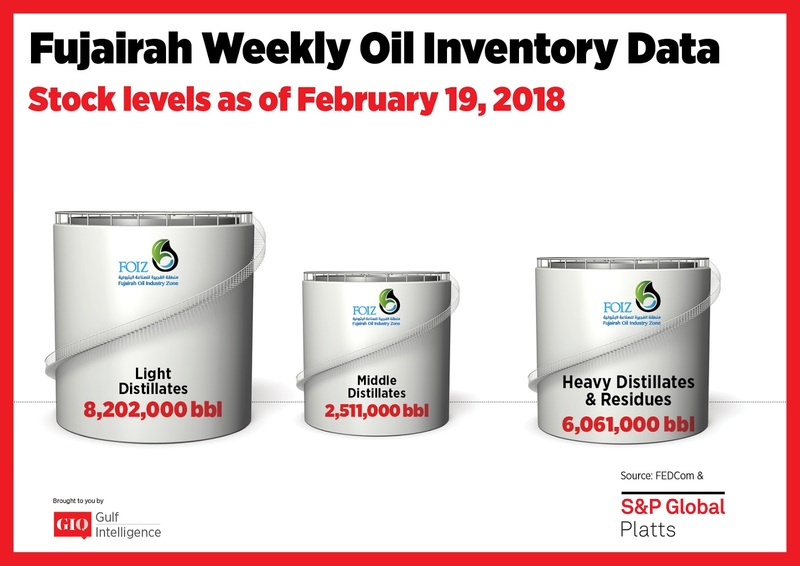 But this is 37% lower year-on-year due to tighter supply following a colder-than-average winter as well as some major refinery outages in the region, Platts Analytics said. The East-West gasoil EFS was minus $4.09/mt Tuesday, well below the levels to move extra gasoil flows to the West. Surplus barrels of low sulfur diesel from India and the Middle East are instead being diverted to Singapore. But jet cargoes continue to move to Europe in high volumes. Data from PJK International showed ARA jet kerosene stocks at a five-month low Tuesday. 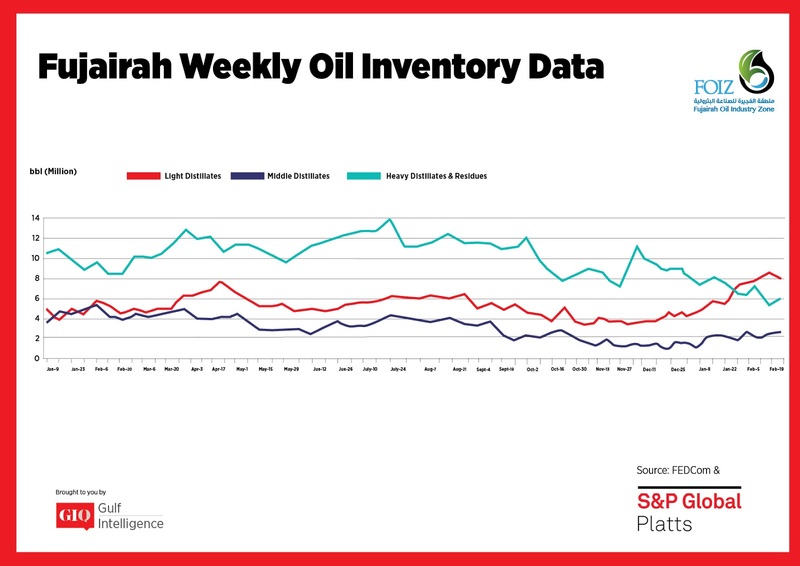 Heavy distillates and residues stocks also rose 14.4% to 6.06 million barrels, rebounding after falling to a record low of 5.298 million barrels the week before. A flat market structure and mixed outlook for bunker demand are are likely to continue to keep inventories low, however. The premium for Fujairah ex-wharf 380 CST bunker over cargoes -- indicative of the break-bulk margin -- has averaged $4.70/mt so far in 2018, compared to an average of $2.82/mt in Q4, 2017.